This is the map of the Barcelona metro (Spain) or also called “Barcelona Metro”. 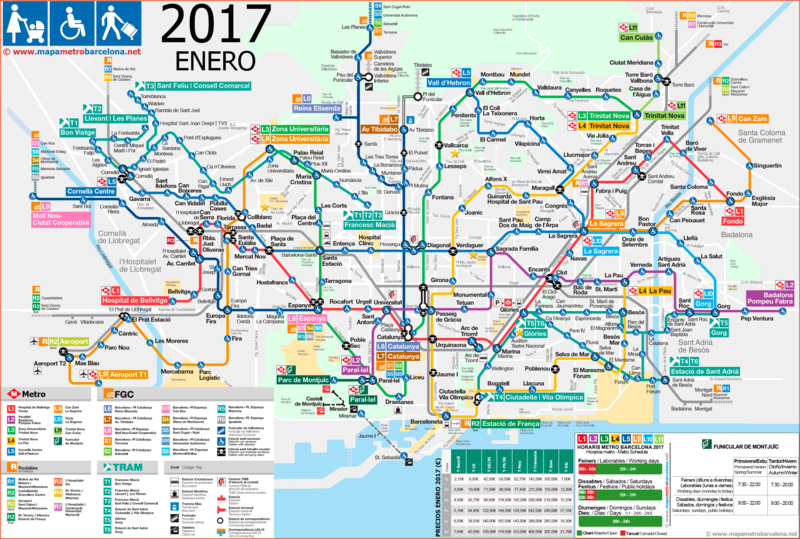 Barcelona metro map, year 2017, travel, disabled, disabled people, baggage, wheelchair, prams, babe's prams. It was extended with new stations in the year 2011, and had 166 Tube stations along 125 Km (77.7 miles), ie, each station 753 meters (0.46 miles). But in February of the year 2016, They were inaugurated 15 new stations on the line 9 sure, it goes from the airport to the city center for a price of 4,50 Euros. So now the Barcelona metro has 181 stations, 145 Km (90.1 miles) total. The map of the year 2017 They have added new lifts and improved graphic design. 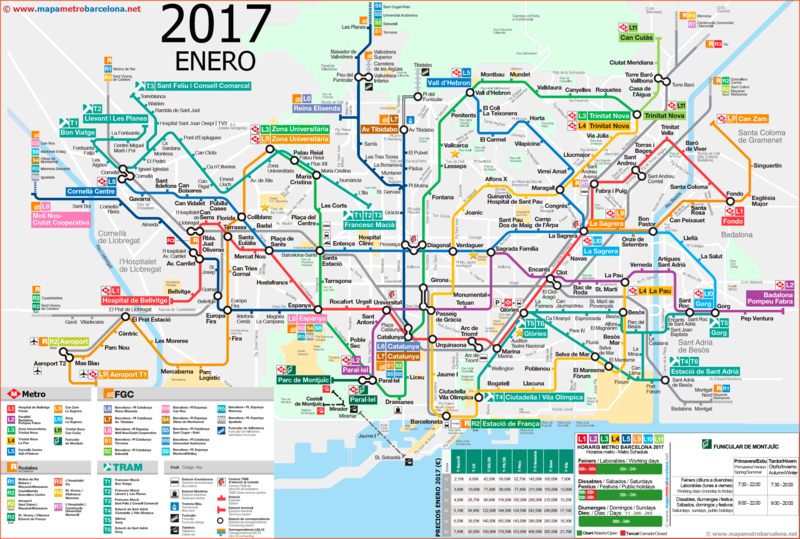 Barcelona metro map 2017, with city background. Barcelona metro map, year 2017, printable version low ink. RECOMMENDATION: On the web TicketBar, You can buy tickets in advance Amusement, museums, monuments, and other interesting things about the city of Barcelona, museums, attractions, events, parties, and curious things that will surprise you. Sometimes, some of these tickets, They sell them at a discount of up to 20%. 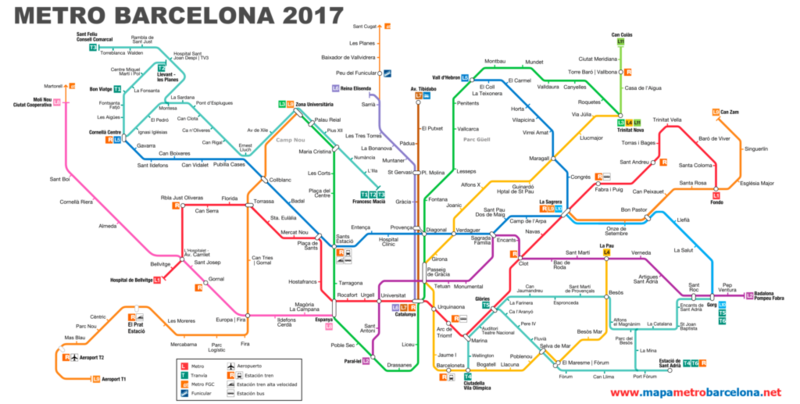 Unofficial website of the Barcelona Metro. Official website of Metro de Barcelona. Sale of travel tickets Barcelona (English Version). Hello, if you say that seguratas not pay fines. I have to do, because one day I was caught with a pink card. I approached the guy and as was the subway entrance was fixed on the card he used to chop and (It was just three stops) and he asked me card, I showed the documents and asked me my name and write down told me that I would get a letter with a fine to my home. I know the seguratas not pay fines. It sure did to scare. In the interest of all, Tell us how it go please. NECESITAMOS lo mismo para Neighborhoods!!! thank you very much for your work.